We made our trip to Pelican Inn approximately 8 years ago. Since then we have traveled as a family to many, natural escapes. To this day our children still rank Pelican Inn on Dog Island as their favorite. The trip was rustic, remote and quiet. 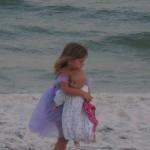 Our girls, aged 4 and 9 at the time, spent their days playing on the beach, catching hermit crabs, fish and sand fleas. Their nights were spent searching for ghost crabs and swinging on the porch. The trip does require planning. There were NO stores/restaurants on the island. You must bring everything with you. If you do run out of something, you can pay the local ferry captain to pick up from Carrabelle. This will cost more than you might expect so bring more of everything than you might need. No internet, no TV, limited cell coverage. The Inn does have a library, puzzles, beach toys and 'extras' if needed. During our stay, other guests would hand down their extras instead of throwing them away as they left. This made for a sudden surge in food variety, making things much easier for adults in charge of meals. Room tip: All rooms have beach views. Because this is a remote Inn, all are quiet.